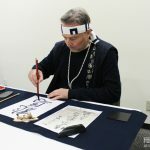 Despite my regular attendance to the enbu organized in Tokyo and the surrounding prefectures these last six years, I’m sorry to say that the first time I saw Hyoho Taisha-ryu (henceforward HTR) was three years ago in the February enbu organized in the Nippon Budokan by the Nihon Kobudo Kyokai. I guess the reason is the distance: the school is based in Yatsushiro in Kumamoto Prefecture so it seems only natural they’d not travel 1234 km (766 miles) to demonstrate for ten minutes in every enbu organized in the broader metropolitan area. My first thought upon seeing them though was this: it’s a shame! HTR’s brand of kenjutsu brings an air of freshness in a scene that many would argue it has become somewhat stale and anyone interested in the classic arts should have at least one chance to see them. In the years that passed, it seemed as if my wish has come true: led by 45-year old shihan Takahiro Yamamoto, a direct student of 13th soke Takenori Yamakita (1931-2013) the HTR group has been participating in several enbu all over Japan while at the same time it has established bases in Hong Kong, Italy and Australia as well as in several places across Japan; overall it has over 70 practitioners, an impressive number and not just by the standards of a small provincial school. What’s more – and this is something I learned later, after having the opportunity to meet Yamamoto shihan in person and spent some hours with him- it is one of those very rare cases where the thin balance between deep tradition and up-to-date thinking is kept perfectly. I would strongly argue that if HTR was based anywhere else in Japan, its population would certainly run in the large hundreds. I’m certainly biased: as I have mentioned before, my koryu background is in a Sengoku Jidai school (Toda-ha Buko-ryu/THBR) so I’m certainly more attracted to schools that exhibit similar characteristics – stances kept close to the ground, cuts with the full length of the blade and to the weak spots of an armor, study of occurrences were things go terribly wrong and an attitude that gives less emphasis to self-improvement and more to survival under life-and-death situations. With many schools having been created well into the Edo period, a great part of what we see today in enbu reflects the attitudes and the conditions of that time; in HTR’s case (as in THBR’s) the opposite is obvious. Even from that first enbu at the Budokan, I knew I wanted to learn more about that small school from Kumamoto. As I have mentioned before, my job can be very rewarding: wearing the “Hiden” hat makes it much easier to approach pretty much anyone involved in the world of koryu; things are even better if said persons are active on the Internet. A combination of plain, honest digital door-knocking and a few well-placed calls and emails from my esteemed colleagues at the magazine was all it took to arrange a “hands-on trial” of HTR without even going over to Kumamoto: Yamamoto shihan and several of his students were coming to Tokyo for two enbu (one in Yasukuni and one in Nakano for the 80th year anniversary of the Nihon Kobudo Shinkokai) and they’d also train with their Tokyo study group. All I had to do was pack my keikogi, hakama and sword and go meet them in the Tokyo Budokan in Adachi-ku and the Hamacho Sport center, a short bike-ride from my home in Asakusa. Before going into the actual experience though, allow me to delve into the past for a while; this is very appropriate to the spirit of the school since the two names that come up more often when talking with Yamamoto shihan are his teacher, Takenori Yamakita and his school’s founder, the legendary Kurando Marume (1540-1629). Kumamoto, Yatsushiro-born Marume was born and raised a bushi and his kenjutsu skills born in combat and in training were good enough to lead him to Kyoto to challenge another pre-Edo kenjutsu legend, Shinkage-ryu founder, Kamiizumi Ise no Kami Nobutsuna. Apparently Marume was not yet ready for Nobutsuna and after his defeat, he became his student. Seven years later, he became good enough to perform with his teacher in a demonstration for shogun Ashikaga Yoshiteru and one year after that, to attain menkyo-kaiden status – after that he was free to start his own school and to find employment as a sword instructor to the retainers of the Sagara clan of then Higo Prefecture. A milestone in Marume’s life was another challenge a few years later – this time his opponent was Yagyu Munenori, son of another student of Nobutsuna, Yagyu Munetoshi, who had in the meanwhile become a sword teacher to the Tokugawa shoguns. According to HTR lore, Munenori had proclaimed to be the best swordsman in Japan and Marume traveled to Edo to, ahem, investigate the matter. Details of their meeting aren’t known but Munenori’s rephrasing of his initial statement is quite telling: he was indeed the greatest under heaven in the east while Marume was the greatest under heaven in the west. 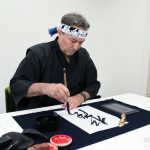 This statement by the way is extremely important for today’s heirs to the HTR legacy: being Yamakita soke’s parting words to Yamamoto sensei and his fellow members, it is the driving force for the continuation of the school and, perhaps, another reason why its presence is becoming more and more felt recently. The way Yamamoto shihan intends, as the school’s chief instructor, to implement that statement in our time becomes obvious when you step in the dojo with him. Before the newcomer picks up a bokuto and starts training in the core of the school (kamae, suburi, principles etc. ), Yamamoto shihan kickstarts their body with a set of exercises (aptly called “shintai sousa” or “body management”) that at first seem closer to modern body-mechanics than to 500 year-old method of training soldiers. 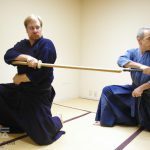 Based on things he saw his teacher do (but never having been explicitly taught how to do them), HTR’s shihan explains the importance of keeping a low center, of being aware, mentally and physically, of being connected both internally (i.e. good alignment of the body) and externally (i.e. keeping a firm contact with the opponent) and of creating incredible power. 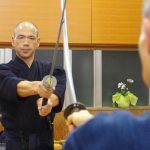 If the shintai sousa exercises illustrate the modern thinking of a 45 year-old, the HTR basics and principles bring us back to the times of Kurando Marume and Kamiizumi Nobutsuna. 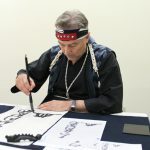 Anyone who has ever seen Yagyu Shinkage-ryu will recognize the “san-ten-dachi”, the three points of contact of the foot with the ground (the point below the big toe, the little toe and the heel) or the “tatsu-no-kuchi”, the sword-grip reminding of a dragon’s mouth; these are elements prevalent in HTR too, proving that Nobutsuna’s legacy hasn’t only been preserved by the “orthodox” Shinkage lines. Other evidence to support this are HTR’s kamae: the very open hasso-like koudan no kamae and the fearsome enpi and hankai juudan with the sword held parallel to the ground at shoulder height and aiming at the opponent’s face are also indicative of the Shinkage legacy; same goes for the identical to the Yagyu Shinkage-ryu fukurojinai used for free practice. 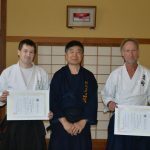 The three kata we worked with Yamamoto shihan come from two different sets of HTR’s curriculum. 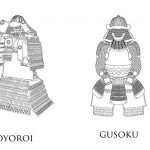 The first, “Omote” was from the 18-part set “Kata” which has the practitioners work with wooden swords (14 are tachi versus tachi and 4 are tachi versus kodachi) and the other two “Sokushu” and “Gyakuaku”, where from the 9-part set “Kumitachi” where practitioners use their real swords (iaito or shinken for the higher levels). Apart from these two sets, the school’s curriculum also includes two 9-part sets of iai; we didn’t work on those but Yamamoto shihan was kind enough to demonstrate HTR’s reishiki for the iai which, interestingly enough, includes a first purification kata involving an evocation to Marishiten, a Bodhisattva often associated with the martial traditions of Japan. Marishiten is important enough for the particular tradition to appear on some of the exponents’ wooden weapons. Incidentally I found this aspect of HTR fascinating and indicative of its strong ties to its past: not only the weapons are marked in the tsukakashira with the school’s kamon, the 9-circle “kuyou” but each one bears an inscription and the seal of Kumamoto’s Kanrenji temple; Kanrenji has a long-lasting relationship with HTR and in a way “blesses” its members weapons. Besides the name of Marishiten, another weapon from the ones I saw and practiced with had the inscription “Shinrai mimi wo oou ni oyobazu” an old Chinese saying meaning “When the thunder roars, there’s no time to cover your ears”. There are several such sayings in HTR’s extensive old documents’ collection and they all convey aspects of its strategies, characteristics and principles; the one I mentioned likens HTR’s sword to a thunder, heavy and swift enough to overwhelm the opponent. As I wrote earlier, I find this exciting because it’s refreshingly realistic: many schools keep things “civilized”, bringing to mind sport fencing; HTR’s scenarios are obviously taken from real-life situations and include strikes, kicks or even throws – anything that neutralizes the opponent and keeps the HTR swordsman alive. Incidentally, this was something we discussed with Yamamoto shihan when the conversation came, inevitably, to koryu’s place in the modern world. 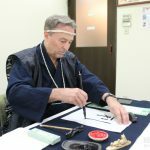 The HTR instructor is also a supporter of the belief that koryu’s essential teachings apply to our times: being completely aware of your surroundings and acting in a coherent, purposeful and efficient way is something that extends well outside the battlefield and something that our generations, living in sheltered, comfortable environments have forgotten. Therefore what Kurando Marume taught is still relevant; we only have to find a path leading to it and someone to point out their application in a life where people don’t move around brandishing swords. Yamamoto sensei thinks it’s possible and his teaching certainly demonstrates he’s right. Between the time we spent together and the time of this writing, HTR has evolved a little more: behind its steering wheel is now Eriko Uehara, the granddaughter of Takenori Yamakita; it’s the first time after 14 generations that a woman becomes soke. Despite his almost obsessive involvement with tradition, Yamamoto shihan is rooted enough to the 21st century to ask him about this. What I did ask him though was if, given the chance, he would have his HTR’s membership rise to the thousands. Even after an encounter as brief as ours, his well-balanced answer wasn’t a surprise: there are certainly merits and demerits in both small and big groups – the most obvious problem with big groups is keeping the transmission correct and as close to the source as possible. As long as he can keep that and display to the world the splendid teachings he received from his teacher and from the other 12 generations that preceded him, he will gladly try to realize that old remark of Hyoho Taisha-ryu being the best under heaven in the west; in our modern, smaller world, perhaps the “west” might not only mean “the west of Japan” and I can’t think of a better person to make this happen. This article wouldn’t had been possible without the great assistance of Hyoho Taisha-ryu’s Takahiro Yamamoto shihan and his students in Tokyo and Kumamoto, especially Kotaro Kawai-san who tolerated my ignorance in the expense of his own precious training time with his teacher. I thank them all and I wish to the kind and courteous Uehara soke whom I only met briefly, good luck in her new position.